Is Runaways Marvel's First Post-Avengers Movie? We know that Marvel's movies are leading up to 2012's Avengers, but has work on the movies that follow already reached the casting stage? That's what some are wondering after an unusual casting announcement was apparently released. All Things Fangirl accidentally stumbled onto something that may be a massive scoop... or perhaps a strange mistake while on a trip to the theater recently; Allie Grant, who may be best known for her role in the Showtime series Weeds is listed in her biography for The Production Company's How I Learned To Drive as available to "be seen opposite Michael Shannon in the upcoming Marvel Studios film Runaways." 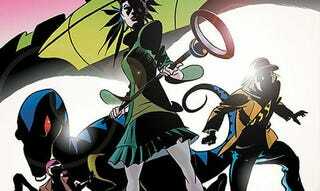 Runaways, based on the Brian K. Vaughan-created series that recently went on hiatus as a comic, has been mentioned more than once as a potential non-Avengers property that would translate well to movies, but there's been no announcement about it actually happening yet. Both ATF and Latino Review wonder if the bio mixes the Marvel property with the (already completed) Joan Jett biopic The Runaways - which does star Michael Shannon - but Grant isn't listed in the cast list for the latter, leaving the question of the Marvel Runaways rumor validity open. As ATF points out, Grant would make a great Gert from the Marvel series, so here's hoping it's true - and that Brian K. Vaughan gets to write the screenplay.